It’s funny, the things you remember about your travels. This morning I was corresponding with my friend Chris about an upcoming trip. I’m flying into Paris, but don’t yet have an itinerary. Germany? Spain? Italy … Rome? 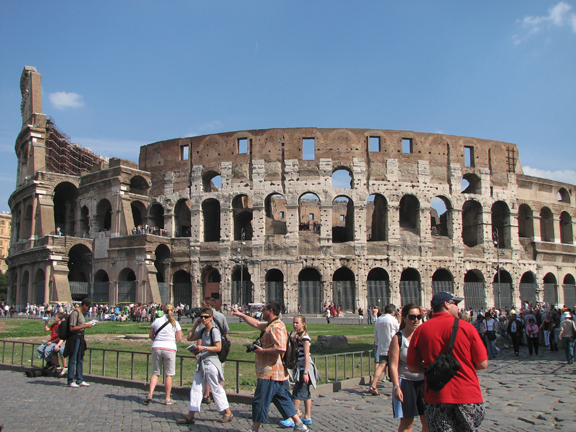 Chris extolled the virtues of Rome in winter—and the convenience of the short-hop airlines like Ryanair, EasyJet and Vueling. 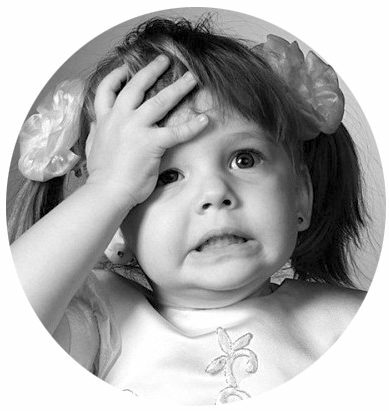 “Oh, nooooo … I will NEVER again set foot on Vueling,” I wrote back. In 2007 [Vueling] stranded us at Fiumicino for something like 13 hours as they made up an endless string of excuses about our flight’s delay. When the airplane finally did arrive, it sounded like it hadn’t been tuned up since 1937. The flight attendants didn’t know how to work the buttons and broke into giggle fits as the cabin lights flashed on and off. And as much as I enjoyed the disco effect of the improvised strobes, I was dismayed to land in Paris at 1:30 a.m. and learn that Vueling hadn’t bothered to put our baggage on the plane. So I served as a makeshift interpreter between a bunch of exhausted, emotionally volatile Italians and an indifferent French baggage-claim claim clerk at CDG until about 3:30 a.m., when our luggage finally showed up on another flight. Alas … there were no taxis to be found, so Esteban and I didn’t make it to the hotel until about 5 a.m. GRRRRR. Recalling that unhappy memory prompted me to revisit my 2007 travel journal and photos tonight. I wasn’t surprised to be reminded that my Fiumicino airport adventure was just one small thread in an enormous tapestry of rich experiences. I still haven’t decided where I’ll end up in a few weeks. (Suggestions are welcome!) 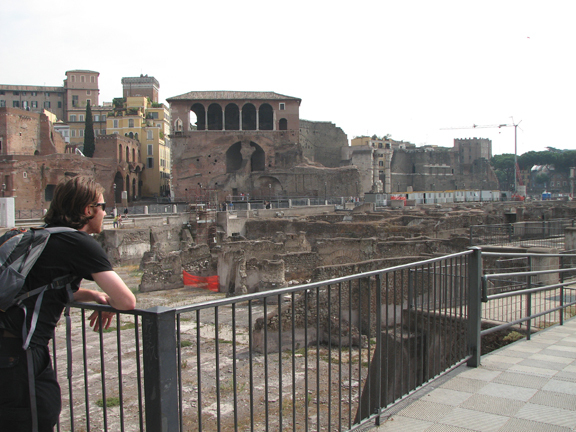 But in the meantime, I thought you might enjoy my memories of Rome all the same. Armed with a map and a sense of humor, Esteban and I headed out early. 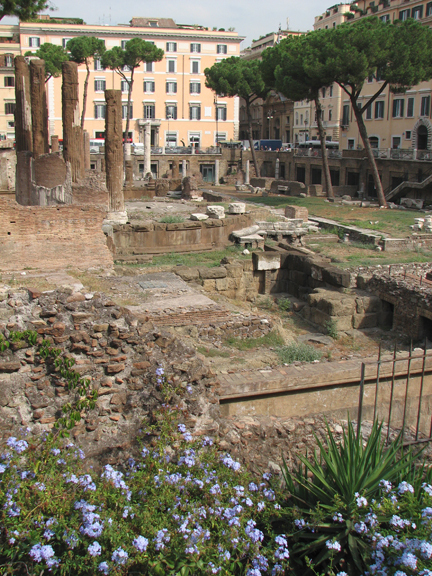 It took a bit of experimentation to find the right bus stop but we were soon on our way to the Colosseum … until we made the impetuous decision to leap off at Largo Argentina. It was extraordinary to be in the middle of this busy, modern city and look down at the ruins of these temples, jutting out of the ground like old bones. Even more remarkable? The ruins were overrun by cats. Sleeping cats. Eating cats. Grooming cats. Cats, cats, cats! 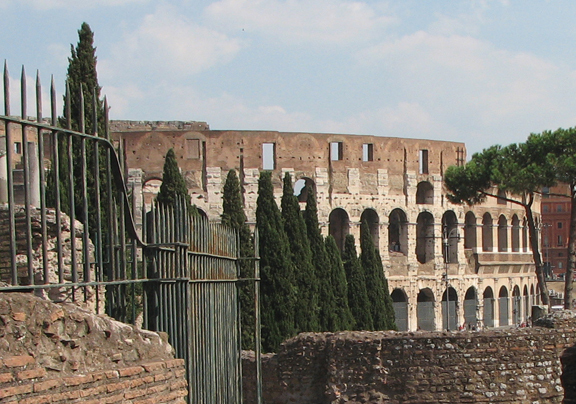 Esteban and I decided to cover the rest of the distance [to the Colosseum] on foot. 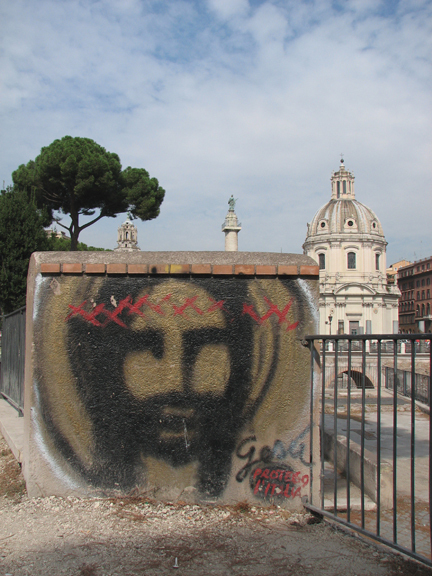 … We gaped at the Vittorio Monument as we dodged the traffic. In Rome people don’t drive so much as hurl themselves into space at impossible speeds and with dubious precision, while gesturing wildly with one hand and honking vigorously with the other. Pedestrians don’t stand a chance. 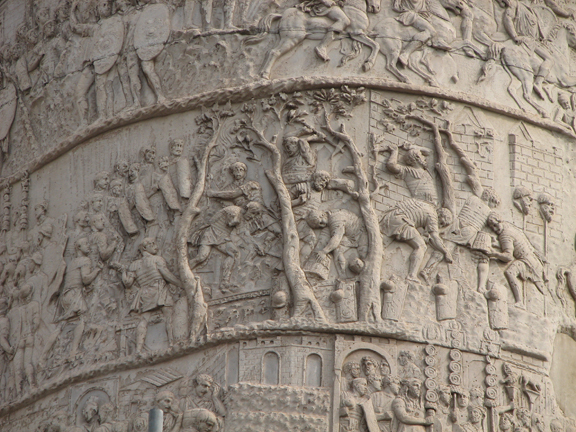 … we stopped for a few minutes at Trajan’s column. I was awestruck that something so ancient could still be so evocative and so vibrant. The noise of the traffic disappeared as the past became my present. 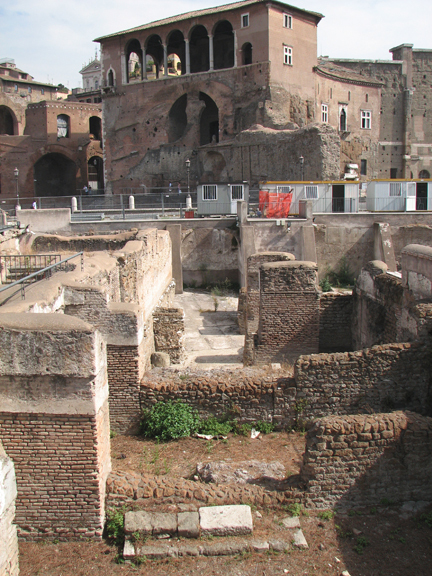 Nearby, we surveyed the ruins of the old public market. It didn’t take much imagination to envision the shopkeepers’ stalls below, or the apartments that once clung to the surrounding hills. 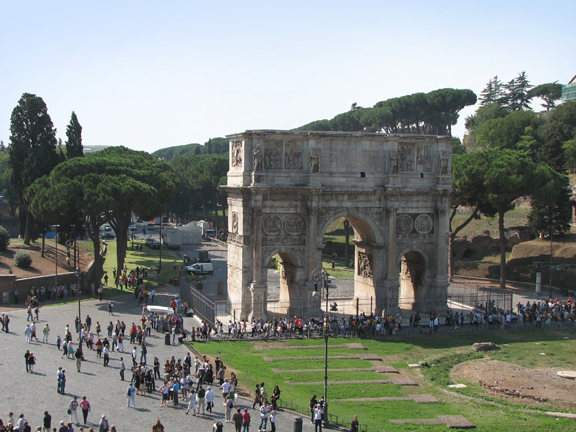 … past the Palatine Hill, past Constantine’s Arch, and right up to the entrance of the Colosseum. Esteban wanted to sit and just take it in. 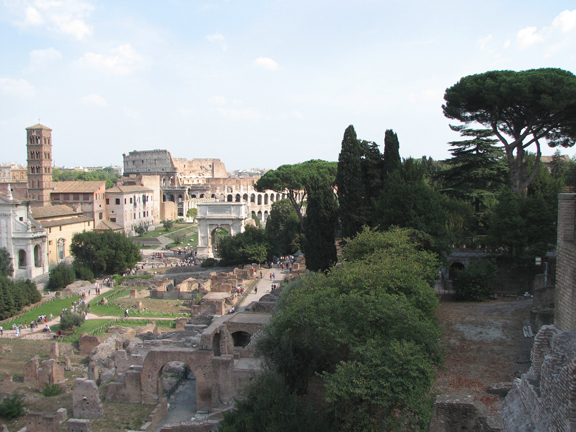 But I wasn’t done exploring, so I shelled out €9 to climb to the top of the Palatine Hill. 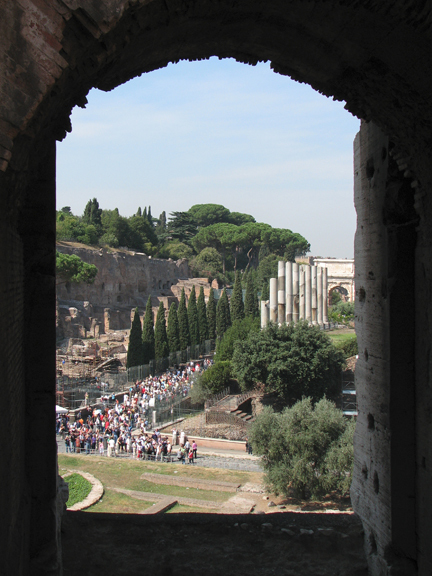 The view from the top was spectacular: Even after her death, Rome still dazzled. 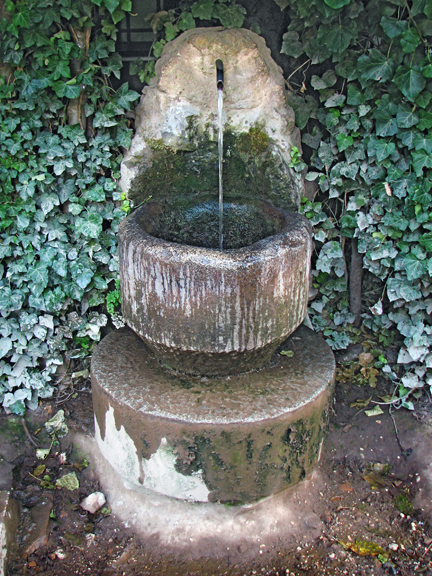 But what most moved me was taking a drink from a fountain that’s been flowing for 2,000 years. 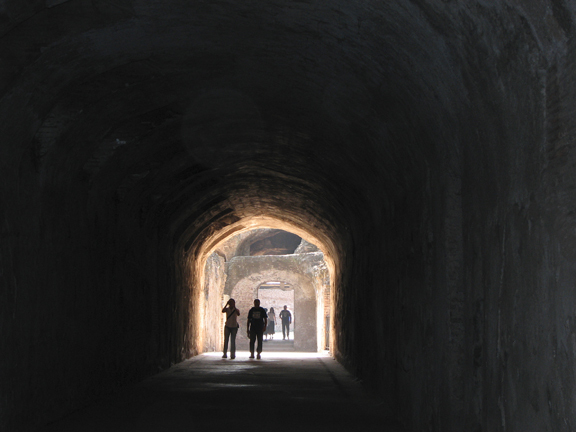 For all I knew, an emperor or a senator had once stood at the same spot to quench his thirst. 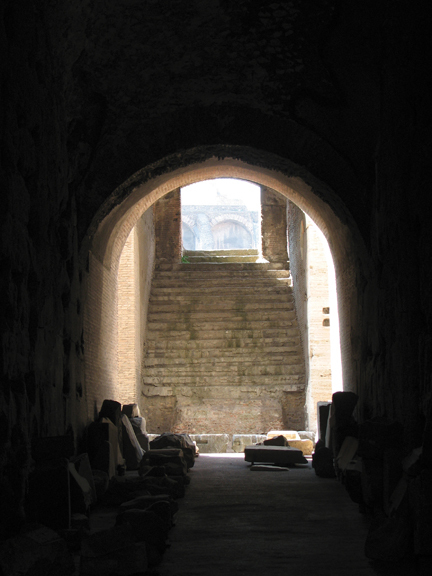 Maybe a gladiator stopped here on his way to his last battle—or maybe just an ordinary woman like me. I stood there for a long time, thinking about the nameless throngs who had tread this same path. Esteban wasn’t up for another long day of walking so we agreed to meet at our shady Palatine spot at 1:30, and I took off on my own. I took the bus all the way to the Colosseum and used the remaining time on my [monument visit] ticket to jump the queue and walk right in. Within moments, I was surrounded by shadows and ghosts. It was difficult not to picture this place filled with eager, bloodthirsty spectators in search of entertainment. I could almost hear the roar of 45,000 people echoing through the halls and feel the heat of the sun on the stands. 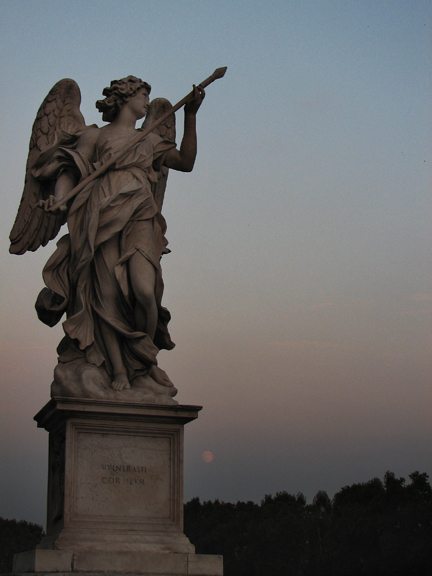 But as night fell I saw another side of the Eternal City — one that is more peaceful and contemplative. I thought about the centuries of human history this old city has witnessed, of the millions of lives she has shaped. 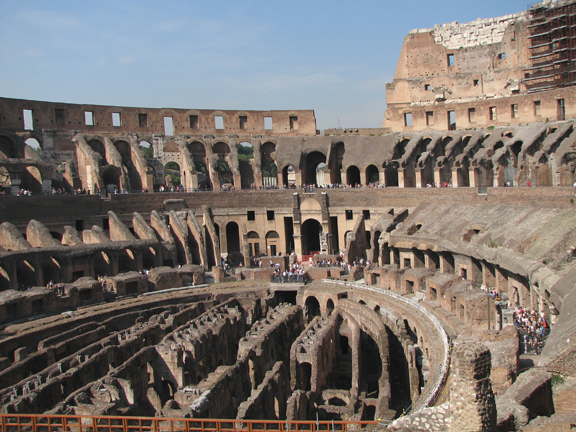 And I thought about how every one of those lives has become a tiny little tile in the wondrous mosaic that is Rome. Next Rumors of my death? Greatly exaggerated. I love that place…and your photos make travel! Can’t decide between Germany, Spain or Italy? Man I want your problems! Thanks for this closer look into a city that has always intrigued me for its wealth of historical leftovers and gateway to the past. And for what it’s worth, I found your descriptions of these pictures to be particularly well-written. By the way, do you speak any Italian, and if so how was your experience with it over there? Dude! You live in FRANCE! You can hop a train to these places any time you want, right? For me, it entails sitting on an airplane for 10 hours with my ears between my knees, enduring my neighbor’s unwelcome conversation and overpowering perfume. Seriously, though … I know I’m extraordinarily lucky to get to travel as much as I do. And yes, io parlo un po’ d’Italiano. I can only conjugate the verbs in the present tense and my vocabulary is limited to common household objects and vegetables, but everyone I encountered in Italy (and I do mean *everyone*) seemed to be delighted by my attempts. Or maybe they were just stifling a laugh. I love, love, love that last photo of the statue! The lighting is just perfect, and I like that you didn’t center it, but included the distant treeline and that beautiful opal-colored sky. Absolutely gorgeous. Thank you, Lis! I loved the quality of the light, too — and I even *more* loved that my little “point and shoot” was able to capture it. Sometimes we luck out, eh? What gloriously evocative writing and pictures! Your description of Roman driving is so funny (and so horribly true); while that closing sentence of Rome as a mosaic of people’s lives is just the perfect metaphor for this city. Don’t you love those black pines? 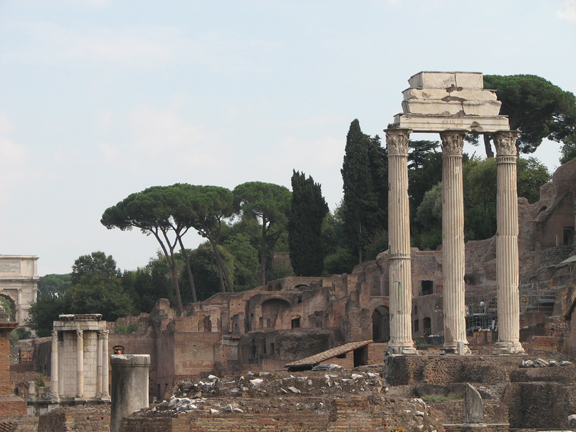 (At least I think that’s what they are, those quintessentially Roman trees.) 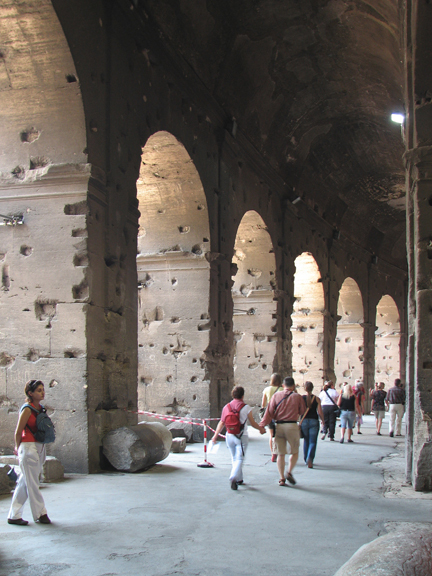 Their spreading canopies make the perfect counterpoint to the tall ruined columns. I spent my only brief visit to Rome wandering the streets without a map (‘In Santa Croce with no Baedeker’ to borrow a Florentine version from E. M. Forster). We stumbled down a shadowy, narrow lane and emerged into a sunny little piazza with a towering column in it. ‘What on earth is that?’ I asked my boyfriend. We went over to investigate its extraordinary carvings. 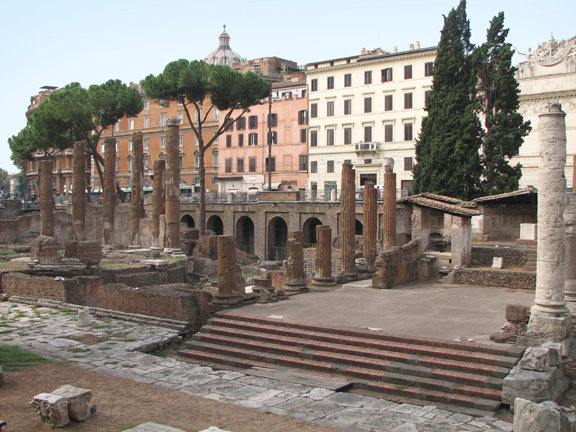 Slowly it dawned on me: we had stumbled across Trajan’s Column. I think that’s the way to do it! Yes, yesss, I love those black pines! Esteban and I jokingly called them “creepy Italian trees,” a line we stole from “Under the Tuscan Sun.” But I thought they were beautiful and striking and unlike anything I’d seen before in my life. 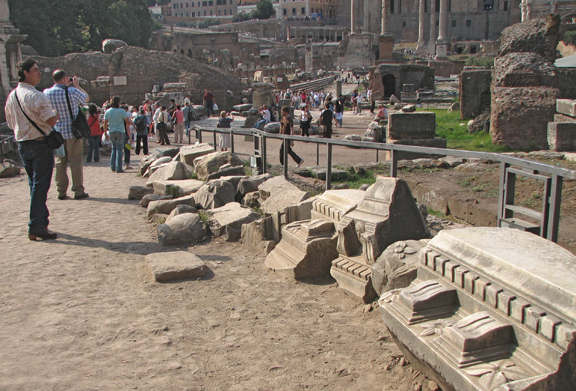 LOVE your story about how you stumbled upon Trajan’s Column, as well. That really *is* the best way to discover a city: Start walking, get lost, and enjoy your discoveries along the way. As for Scotland, believe me — I’ve suggested it. Repeatedly. But Esteban seems intent on a warmer climate. I’ll keep working on him. Grin. I watched a documentary the other day claiming that the Earth’s tectonic plates are slowly moving back together again. That means that in roughly 40 million years, Scotland will find itself right next to Coney Island and I will be able to catch a train from here to Paris. I just can’t wait !!! Hey, John! So good to find your note — and thanks for your kind words. I could have gone on and on about the drivers in Rome; they were like a horrifying/amusing sideshow. It seemed miraculous to us that we witnessed only one accident during our visit. And equally miraculous that we survived. Rome will forever be a special place for me. This post took me back. So glad my post brought back some happy memories, Sara! Thanks for stopping by.